It’s that time of year again…! Even though I haven’t been able to post much here lately, these are the major events I have planned for December! 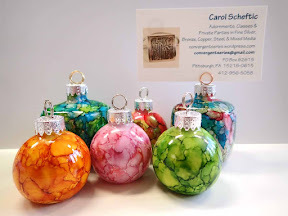 Arts & Crafts Fair, Saturday, December 8, 9 am to 6 pm, curated by the C. C. Mellor Library in Edgewood, PA. Find me and dozens of other local artists in the festive Edgewood Community House adjacent to the library. Studio Open House: Saturday & Sunday, December 15 & 16, Noon to 6 pm on Saturday (probably more like 1 to 5:30 on Sunday), in my studio at the Wilkins School Community Center (WSCC) in Regent Square. Since this is where I make my creations, this is the place to see the widest selection of my offerings! Please note that my Saturday event runs right up until WSCC’s Sustainable Neighborhood Holiday Potluck, and you’re welcome to stay and join in on that too! UPDATE — A (very rare) SALE! In my studio (Dec 15-16 only), select class-demo pieces will be 10% off! I don’t mark my prices up just so I can later offer them at a discount… But in classes, I often make smaller, simpler pieces to illustrate a technique or concept, or to answer a question, ones that I later finish and offer for sale. This will be your chance to purchase a few of those at a discount! Second-round Studio Shopping, by appointment only, again in my studio at WSCC. For those who come at one of the above times, and someone you’re with expresses interest in something, and you’d like to come back without them to see if it’s still available for you to purchase as a gift, but can’t get there at another official event-time … I’m still happy to try to help you out! Schedule an appointment for Dec 17, 18, or 19 at a time that will work for both of us! The main floor shop at The Artsmiths of Pittsburgh Arts and Cultural Center in Mt. Lebanon, PA, ongoing. The H*liday mART at Sweetwater Center for the Arts in Sewickley (Nov 24 – Dec 9). The Holiday Artisan Market at the North Hills Art Center in Ross Township (Nov 17 – Dec 8). Cherry Blossom Botany (below) is in the Cranberry Artists Network’s 2108 Holiday Show (Nov 8 – Dec 20, 2018) at the Cranberry Township Municipal Building, 2525 Rochester Road, Cranberry Township, PA 16066. Random Rainbow #2 (shown in my previous post) is in the Pittsburgh Society of Artists 53rd Annual Exhibition (Nov 9 – Dec 7, 2018) at the 3rd Street Gallery, 220 3rd Street, Carnegie, PA 15106. Looking for a class or workshop? Private / Semi-private lessons. If you want to make something special yourself, the only times I still have open for the remainder of this year are the afternoons of Dec 17, 18, or 19 (Mon thru Weds). Contact me for details. (mostly) Second (mostly) Saturday Studio Sessions will resume on Saturday, January 12, 2019. These are for students who want to come and use my tools and equipement while I hold my monthly mini open house and / or work on my own projects. (I’ll answer questions but don’t hold formal lessons during these times.) It’s first-come / first-served, so just let me know if you want me to hold a space for you (or put you on my waiting list) for that date. My next workshops will be in 2019. The first one I have scheduled for next year will be on Friday, January 18, from 6 to 9 pm, at the North Hills Art Center. 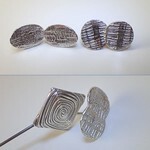 Petite on Posts will involve a fine silver project where you’ll learn how to make a pair of post earrings (or, if you prefer, small lapel pins). Registration should open on their website by the start of January (maybe late December) and I’ll (try to remember to) update the above link then. I’ll post news about other 2019 classes early in the new year too. If you haven’t been over to The Arsmiths of Pittsburgh to see their great Instructors Show yet, you still have two more chances, this Saturday or Sunday (July 7 or 8). Not only does the show include a range of different styles from the various artists who teach there, but Artsmith’s proceeds from this show will be targeted specifically to support their great education programs! Whether or not we manage to connect in person this weekend, we’ll have another chance next weekend! You’ll be able to shop some of my creations and / or talk with me about any of my upcoming classes (at four separate venues), when I’ll hold another Second Saturday Open House session in my studio. That’ll be Saturday, July 14, and I should be there from about 1 to 5 pm. Stop by any time! Next weekend’s bonus for one or two of my students: If you’d like to come over and use the tools & equipment in my studio during the Open House, I can have part of one table set up for that on the 14th too. Because I’ll have a few of my own projects going too, for students it’s really best if you reach out in advance to be sure I’ll have a spot for you. This Saturday, June 9, is a “Second Saturday”! So I am, once again, planning a little Studio Open House. For more reasons than it’s worth listing here, this month I’m shifting the time a bit later than usual: 2 to 6 pm. I’ll have pieces for sale, along with information about the various workshops I have scheduled for this summer or might still add to the calendar. The main reason for the slightly-later time is that the Regent Square Civic Association’s Second Saturday event will be at my building, and that’s scheduled for 4 to 7 pm. So I tried to plan my Open House to overlap: you can visit me from 2 to 6, if you’re able to come later in that range you can check RSCA out too, and I can still join them from about 6 until 7. Follow either link above for a little more information on what each event offers. Stop by for the full effect! Next Saturday, June 16, is my first workshop of the summer, where The Artsmiths of Pittsburgh will offer my reversible hollow silver bead class. Some people call these “lentil” beads, because their underlying shape is similar to a very oversized lentil. Others call them “saucer” beads, though I never imagined flying saucers that looked quite like these. Long-time readers of this blog will know, however, that I love making lentil beads, and I think they make a great class projet too. The photos with this post are meant to show that even a complete beginner can master the making of a relatively simple one that is still impressive! 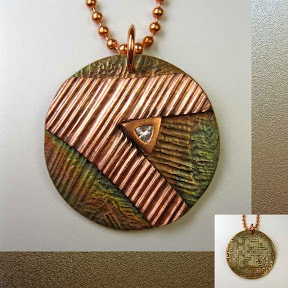 Those with some prior metal clay experience can work a few more advanced techniques into their designs, but you’ll have to come to class to see some samples of those! 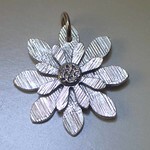 At Artsmiths, we will cover ways to make yours so it can be worn all by itself as a pendant. Or, if you’re into beading, we’ll cover ways that are ideal for stringing it with a bead selection of your choice. 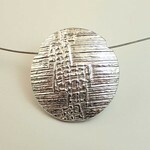 Hint: the pieces in the photos here are designed for beading, but can be worn alone as pendants, as shown. Follow the class link, above, to see some more basic samples and to find out how to register for this session. Again, I’m really sorry I haven’t been posting much here lately. (I’m apologizing both to myself and to you!) Facebook is such a thought-sink! I’m not talking about how it can be a general time-sink; I miss all sorts of posts because I don’t spend much time browsing there. But I do spend some participating in a few relevant groups (on specific techniques and on art and jewelry in general; not all the possible ones, but a few!) where I oten find myself anwering questions or making comments there that, pre-Fb, I would have written up as posts here or on public blogs by others. This bothers me: the class-link above goes to a public page I’ve written, while the two event-links above go to publicly-available Facebook-page events (perhaps with an annoying banner asking you to sign in / up to Facebook, but at least visible). But there’s no way for me to link here to something I’ve written in a “closed” art / jewelry group. I do understand the use of “closed” groups to help reduce the risk of spam, trolls, etc., but I’m still struggling with the idea of spending my time writing up useful information that is then limited in how far it can be shared. If I’m going to write it up, I want it to be available to anyone who’s interested! Well, of course, I could copy my comments and post them here, but they’re often part of a thread, and I wouldn’t feel comfortable copying all that from a private to a public space; so that would mean re-writing everything to build up my own context. And that’s just more effort than seems worth it when I’d rather be making than writing in the first place! Have you solved this dilemma? Do you know anyone else who has? Your thoughts (comments, links, pointers, whatever) would be much appreciated! So many happenings on Saturday, May 12! It’s Second Saturday time again! My studio will be open for last-minute Mother’s Day shopping, and more, on Saturday, May 12, from approximately 9 am through 1 pm. The Regent Square community-wide yard sale will be that day, from 8 am to 3 pm. The offerings will switch to raft beer and hot dogs from 11 am to 1 pm. 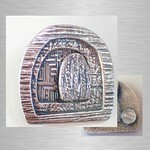 As soon as I’ve done a bit of shopping at (1) and (2) I will head up to Room #25 and open up my own art/jewelry show! But I’ll have to leave by about 1 pm, so I can dash over for the opening of the Artsmiths of Pittsburgh’s Instructors Exhibit! There are a dozen of us in that show, which will run through July 8. I’ve got (count them!) sixteen different pieces in it, illustrations of the kinds of things I have taught or will soon be teaching there! They’re all for sale, and all of Artsmiths’ proceeds from the sale will go towards support of their instructional programming! 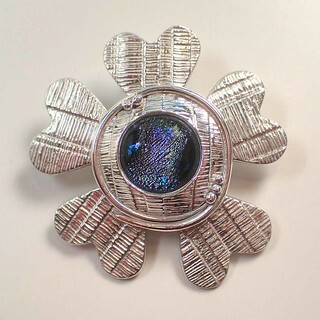 I am going to try to also get off to the opening of another show that will feature two of my art-jewelry pieces, one each in steel (with enamel) and silver (with a cubic zirconia). They are in the the North Hills Art Center’s Spring Regional Show. The opening reception is from 7 to 9 pm on Saturday and then the show will continue whenever the Center is open, for the rest of this month and then through June 8. Finally, please accept my apologies for not yet having gotten around to posting my upcoming teaching schedule! Well, I did post it: there’s a printed copy of my next six classes hanging just outside my studio door, and I will be delighted to discuss them there! And the Artsmiths Instructors’ Show is set up so that all of us there will have the chance to talk about those upcoming classes. If I make it up to North Hills, I can talk about my offerings there too. And I will try to post more information online in the next few days…. I do hope that lots of folks will be able to join me, at one or more of these events! 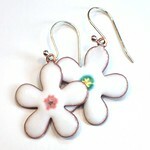 Need a last-minute, hand-made, one-of-a-kind gift? Sorry for the last-minute confirmation, but I will be in my studio this afternoon! The section of my work-area nearest the door is still set up for shopping! Stop by and see what’s available at a whole range of prices. I should get there by 2:30, and should stay until about 6:30. Since I didn’t go in either Thursday or Friday (instead doing late-season yard-work!) 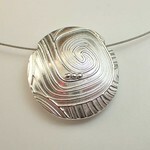 with today’s rain I’ll be back in the studio working on a few pieces I need to have finished by the end of next week. (Pretty much everything I make takes several cycles of activity, often spread over several days, with time in between for drying or re-hydrating or kiln-firing or …) I’ll be wearing grubby work-clothes, sitting at my other work-table, so you’ll get more of a clue of what my typical working environment is like than usually happens when I open up for a show! I don’t know if I’ll go back on Sunday, Christmas Eve: I’ll have to see how things go today before I decide that. I am holding a couple hours open tomorrow just in case, so if you can’t make it today but would like to schedule a time to meet me there tomorrow, please let me know! And, whether you come by today or if you’ve already made a purchase from any of my collections earlier this year, please know how very much I appreciate your interest and support! Thank you … Merry Christmas … Happy Holidays … and Best Wishes for the New Year! The main floor shop at The Artsmiths of Pittsburgh in Mt. Lebanon, PA. The Gift Shop at the Hoyt Center for the Arts in New Castle, PA. The Holiday Artisan Market at the North Hills Art Center in Ross Twp. through December 9. The H*liday mART at Sweetwater Center for the Arts in Sewickley through December 9. The Cranberry Artists Network Holiday Show in the Cranberry Township Municipal Building , through December 20. I hope I’ll see local folks at one or more of those! If I don’t see you, no matter where you’re from, please know that I’m wishing you all the best for this holiday season and beyond! p.s., Sorry for the big gap in posting! I have a slew of articles started, in draft form, but for one reason or another (e.g., I may not have photos to illustrate what I’m trying to say; or I have photos but haven’t written the words yet…) I just haven’t managed to get any of them finished and posted. Most of them should still appear eventually! And the first one is a birthday party this Saturday! What with a lot of travel, gardening, garden-related travel, and more this summer, it’s been way too long since I’ve invited folks over to my studio at the Wilkins School Community Center (WSCC) in Regent Square. But I’m eager to make up for that: I already have three free events lined up there in the next few weeks. Everyone at WSCC is celebrating our building’s 90th birthday! Lots of groups and instructors are offering demos and free lessons in all the various rooms, rotating each hour, starting at 9 am, and ending at 1 pm. I’ll also have lots of items for sale. At 1 pm, we’ll gather downstairs to offer a toast to the building, celebrate with cake, and explore its new mural! After that party, I’ll head back upstairs for about another hour, to try to get my demo table back to a space I can work on next week. If you can’t get here before 1, this will be another time for you to come and shop. As long as folks are around and interested, I can stay open until about 3. The Regent Square Civic Association’s (RSCA) inaugural Second Saturday in the Square kicks of at WSCC that afternoon! Food trucks, craft beer, live music, children’s activities, and more! So of course, I’ll open my studio for another show then! The RSCA’s event actually runs from 4 to 7 pm. Due to prior commitments both before and after that time, it’s going to be a challenge for me to fit this in. But I will!!! I’ll likely arrive right at 4, and will have to leave no later than 6:30. So please be sure to catch me while I am there that day. The delightful Indie Knit and Spin (IKS) will be back at WSCC! I’m not an official IKS vendor: my studio just happens to be right in the middle of their wonderful show, so I’ll have my “shop” open then too. Sometimes, but not always, I offer button-making workshops at IKS. I’m not doing that with this one, but I will offer two (one each in silver and bronze) at the North Hills Art Center in October. If you’re interested, please sign up for one or both of those! If you can’t make it to one of the above three events, just get in touch and let’s arrange another time that will work for both of us! An Open House (with both demos and pieces for sale) in my studio during the community center‘s big fall open house day, and another Open House to coincide with Indie Knit & Spin (aka IKS). Because of the IKS-day Open House, I don’t plan to hold either type of button-making class at that event this year. But for those wishing to make buttons, I will be offering two separate classes on that at NHAC this fall. There will, of course, be pieces out for sale at all my “usual” locations, Artsmiths, the Hoyt, and Portage Hill. And I’m hoping to have pieces out for sale at various other market-places, though most of that may be more in the Thanksgiving to Christmas range … with details to follow! Then in the new year, I may try to tweak the plan a bit for winter into spring, swapping some multi-session classes into Artsmiths and my studio; and then offering some single session ones at NHAC. But in addition to just offering a heads-up about what’s to come, there’s another reason for this post. I have a one-day Easy Earring Extravaganza project scheduled for next week, on August 16, and the deadline for you to register is looming! Although I promote it as being a chance to make several pairs of earrings, what is an earring but an charm or a small pendant or other such element, where the maker may have just put the hole in a different place! 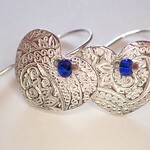 Most of my other sessions go into depth on a particular technique applied to one specific design, but the Earring Extravaganza is different: with that one the goal is to help you go a bit more free-form for quantity, where you produce a number of simple pieces, whether that’d be to give yourself a little treat or to grab a chance to get started on holiday-season gifts. Now, officially, the deadline is a week before the start of the first class, which is a week from the day I’m posting this! So if you want to join in on that one, please register right away!!! Technically, registration should close at the end of the day on Wednesday, August 9, but I think they’ll hold off closing it until early on Thursday morning. As long as I have the count by 10 am on Thursday, I can still get my order for materials in by that vendor’s 11 am cut-off for shipping, and we’ll be fine. Should you happen to try to register later today, or very early tomorrow, before I have to place the order, and for some reason you can’t get the form to work, please just call or email me on Thursday morning (best time would be between 9 and 10 am), and I’ll be glad to help you! May 20: Once again, it’s the great, big Regent Square Community Yard Sale … so that’s the day Wilkins School Community Center will have its annual fund-raiser, which this year features “Books, Beer, Plants, and Dogs” … and I’ll have my studio open from around 10 am until at least 2 pm. Jewelry will be available (at regular prices) plus I’ll be featuring lots of little, potted aloe plants too, and those will be available at yard-sale prices. I’m at WSCC, upstairs, in Room #25. Please come on over! Spring is trying to spring and, once again, this Saturday is the annual community-wide Yard Sale organized by the Regent Square Civic Association. 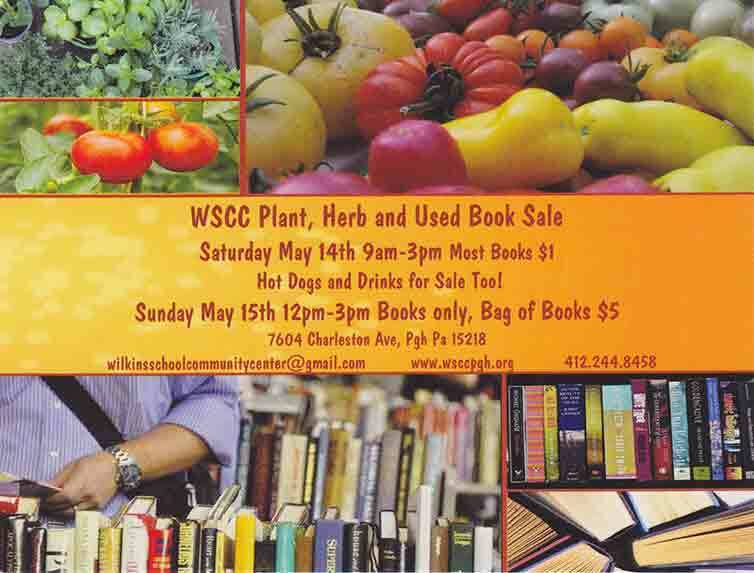 Because there will be all sorts of folks wandering around the neighborhood that day, it’s also the first day of the Wilkins School Community Center’s Spring fundraiser, the Plant, Herb and Used Book Sale, from 8 am to 3 pm. There are tons of books available for $1 each (including lots of children’s- and cook-books) but, if you want any of their plants, it’s usually wise to arrive early. And, because there will be all sorts of folks wandering around WSCC, at the same time as the Plant & Used Book Sale I’ll hold an Open House in my studio too. If you haven’t been there before, come upstairs and find me in Room #25! The yard sales start early; the Herb, Plant, and Used Book Sale is advertized in different places at starting at either 8 or 9 am; but I have had a verrry long week, and I’m not promising to get over to Regent Square before 9 am. And, since everything will be in full swing by then, I can’t be sure just when or where I’ll be able to park, so I can’t even promise to have the doors open exactly at 9. I’ve been telling folks that on Saturday my show will start around 9 am, and run until 3 pm. 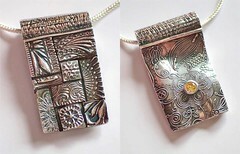 I’ll have my usual Art Jewelry selections and a small number of Aloe Vera plants for sale too. I see those as consistent with my art because a bit of goo from their leaves is great to put on burns … as in those (hopefully little) mistakes with torch or kiln! Flash class offer: just in time for Valentine’s Day! The five reversible domed-heart fine silver pendants shown above have all been delivered to The Artsmiths of Pittsburgh in Mt. Lebanon and are now available for purchase there. I was thinking about making a few more to have on hand during the studio sale I’ll be holding when Indie Knit and Spin returns to the building where I have my studio. But they are fun and easy to make so I’m also proposing a class: you can make one as a gift for someone dear to your heart; or come with a partner and make them for each other; or ask your sweetheart to buy you this class as a gift; there are lots of options, even if you’re a complete beginner! Where: Wilkins School Community Center in Regent Square. 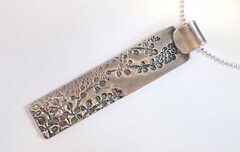 That price includes both the class and enough silver to make one pendant (approximately 1 inch long). Extra material will be available for purchase if you’d like to make more than one pendant (or, say, a pair of earrings too). Several different styles of chain will also be available for purchase. You have two days to decide! I know this is short notice, but I need to have at least four (4) people sign up by 10 pm on Thursday, January 28, in order to run this class. (And the maximum number is seven (7) so I can give everyone enough attention.) To sign up, please either send me an email or leave a comment with this post. I will accept people in the order in which they respond! By around noon on Friday, I will send an email to everyone I’ve heard from with: (a) whether enough people signed up to run the class and (b) whether your request was received before the class filled. I sure hope that a few of you will be able to join me this weekend! Update (8 pm on Thursday): Yes! Thanks so much to everyone who emailed me: this class WILL run on Sunday, as indicated. I’ll email everyone (either later tonight or else tomorrow morning, as noted above) with a few little details. 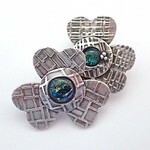 Buttons, Buttons, Yet More Silver Buttons! Did you miss the button-making class at Indie Knit and Spin last November? If so, you’re in luck: I’m offering it again at the February 6 session, from 10 am to 12:30 pm! We had a great time last year! A number of folks wandering along the hallway, checking the vendors and classes in other rooms, stopped in to see what we were doing and said they wished they’d signed up. There aren’t going to be many (if any) other classes at the February event but, since I’ll be using my own studio (i.e., Cosy doesn’t need to pay to rent another whole room for the class, and WSCC doesn’t need to schedule other events around IKS’s use of yet another of the by-the-hour classrooms), I said I’d be happy to offer this one again. Please note: You don’t have to make actual buttons in this workshop! 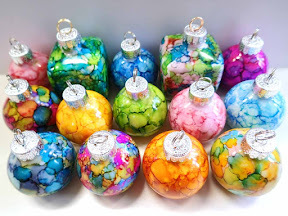 If you’d prefer to make a focal piece to serve as an embellishment on your fiber work, or just want to make some other type of decoration, that’s OK too. Unlike most of my workshops, where I make a point of showing how to make two-sided pieces, for buttons which are typically sewn down onto some fabric, we will just be texturing the “front” side of our pieces. But all it takes is a shift in the placement and/or size of the holes we’ll make in our pieces, and you can have another form of decoration for your work or even a few charms, earrings, or a pendant. It’s up to you! For more details, see the Button Making post at the Indie Knit and Spin website. Please sign up by 8 am on Monday, February 1, so I can have time to place an order that morning for enough material to use in the class. Seating is limited but, if spaces remain after that deadline, I’ll allow others in if but only if I have enough material for late-comers to use. Once again, I forgot to tell Cosy to change the write-up but, as I discussed last fall, I’m planning to use .960 Sterling Silver for the class. If anyone has problems with that alloy, I will have on hand the .999 Fine Silver mentioned in the class description for you to use. The techniques used are the same either way. Here’s looking forward to another fun class with more great participants: it’s only a little over three weeks away now, so please sign up soon. Let the Holiday Season Shopping Season Begin … with Small Business Saturday! 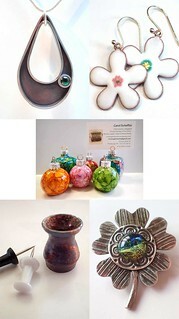 So here are some of the places where you can find my jewelry and/or ornaments! They are listed in roughly chronological order from their special-event start times. 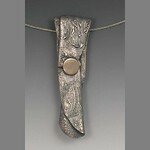 I also have jewelry items (no new ornaments) up at the Portage Hill Gallery (Westfield, NY). Their hours are much longer during the summer season at Chautauqua; but Audrey will likely have a few events over the coming weekends too, so if you’re in the area, do check that out. All of these pieces, and lots more, will be available at one or another of those venues. Please stop by if you can and/or tell others from this area where to find them. Once again, this Saturday is the annual community-wide Yard Sale organized by the Regent Square Civic Association. And, because there will be all sorts of folks wandering around WSCC, at the same time as the Herb and Used Book Sale I’ll hold an Open House in my studio too. I’m upstairs, over the front door, in room #25. I only have a few of my Three Rivers pieces left (and none with something sparkly to indicate the Pittsburgh Point Fountain, as shown in the photo here), but I’ll be making more next month and will be happy to take pre-orders at the Open House. And not to worry, I do have a lot of other inventory, mostly my usual pendants and earrings, but also a few other items too. 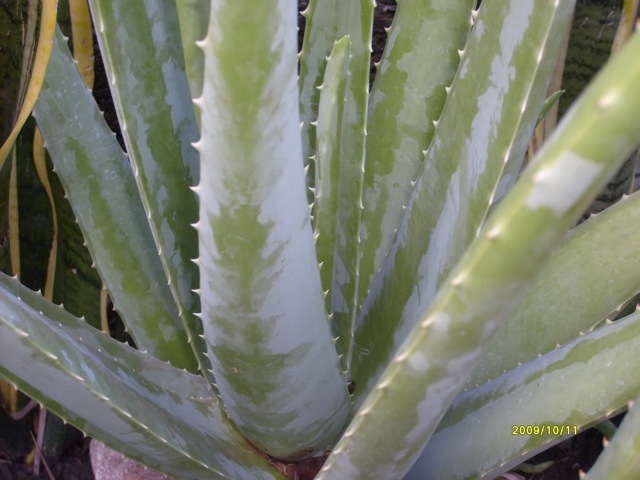 In addition to my usual Art Jewelry selections, again this year I’ll have a collection of Aloe Vera plants for sale too. They are off-shoots of the ones I keep for burns, as in those little mistakes with torch or kiln…! They’re in good “cactus” potting soil in nice clay pots and I’m basically giving the plants away, asking just enough to cover the cost of the pots and the potting mix and the gas it took me to go get those. I’m later than I’d planned in getting this post up so, if you just can’t get there on Saturday, let me know and we can arrange a time on Sunday if that could work for you. I’m going to the Western PA Orienteering Club‘s meet in Frick Park on Sunday afternoon, roughly 12 to 3, but luckily that’s the one event they hold right in my neighborhood, so I’d be close and happy to meet you in my studio before or after that. (Oh, and the book sale will continue, with even lower prices, during that 12 to 3 span on Sunday, so you could go check that out before or after we meet!) That’d be easy for me to arrange: I won’t pack up most of my pieces and turn the display space back into a work-room until Monday or maybe even Tuesday of next week. My one disappointment is that there’s another event on Saturday that I’m going to have to miss: I schedule my Open House to coincide with all the Regent Square events, and this one just happens to be the same day, up the street into Point Breeze at the Edible Teaching Garden where I volunteer some time each week. One of our other volunteers applied for a Love Your Block grant from the city, and got accepted! The idea is that they’ll support the cost of some necessary materials if you can get a community group together to volunteer the time needed to work on some neighborhood improvement project. We needed some “hardscape” features for the garden, things like steps at the entrance (several people have already fallen on the slope there, so we have to do something!) and some critter-deterrent fencing. If you’re in the area and able to go lend a hand any time from 9 am to 1 pm, it’d be much appreciated! It’s a great little group working on a delightful urban edible garden project. I’m including the flyer for it here: click to see it full-size. 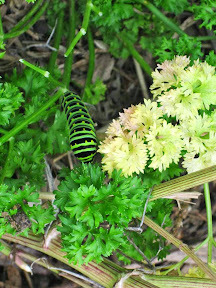 One More Garden Interlude: Field Day at the Edible Teaching Garden. Plus Fall Open House Dates. Yes, I do have art + jewelry topics in the queue to write about, but my spare-moments-brain is still focused on garden events. Our “Field Day” Celebration at the Edible Teaching Garden is scheduled for tomorrow, Saturday, September 13, from 12 Noon to 2 pm. It’s free, open to the public, and we’re hoping we’ll have a great turn-out. If you’re in the area and able, please do stop by. 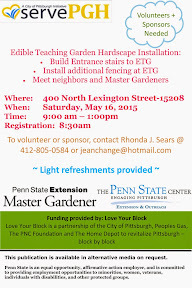 The Edible Teaching Garden, maintained by the Penn State Master Gardeners of Allegheny County, is located in the Point Breeze neighborhood of Pittsburgh, at the corner of Thomas and Lexington. Folks around here seem to go by landmarks a lot, so the other way to describe it is this: just one long-block down and around the corner from the East End Food Co-op, sort of across the street from Construction Junction and the Pittsburgh Center for Creative ReUse. (It’s directly across from the Allegheny County Police Headquarters: on our volunteer “work nights” we often see the local TV news folks shooting their “live” reports on “our” sidewalk, with that building behind them. But Construction Junction and PCCR are “more art-related” ways to describe where it is: see, I really am trying here!) 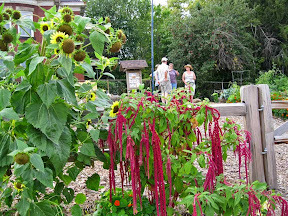 The first photo, above / right, just taken on Wednesday, shows our branching sunflowers (they were a donation, and we don’t know the exact variety), our amaranth (that one is called Love Lies Bleeding), and hints of more, along with a few of our volunteers who were finishing up a discussion about some plans for Saturday. Last fall, I sold a number of dohgu oki in the Open House I held in my studio the day that Indie Knit and Spin was happening in the same building. I’ll be holding another open house to coincide with that again this year (the date is November 15). Even before that, I’ll be having an open house to coincide with Eco Fest (that date is October 11), so I figured I should get a head start in stocking up on those. Lots of good dates in this post: I hope many of you will be able to join me for any or all of those! This Saturday is the annual community-wide Yard Sale organized by the Regent Square Civic Association. And, because there will be all sorts of folks wandering around WSCC, at the same time as the Herb and Used Book Sale I’ll hold an Open House in my studio too. For years I’ve been describing its location as “upstairs, above the front door” at WSCC, but I now have a room number: it’s 25! 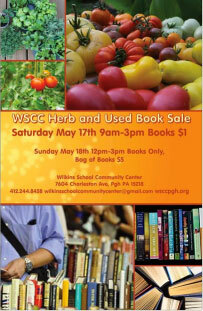 Then, on Sunday from 12 – 3 pm, WSCC will continue their Book Sale (a whole bag for just $5!) and I will be there running a workshop from 12 – 5 pm. If you can’t get to Regent Square on Saturday, you’d be welcome to stop by on Sunday instead, as long as you understand that the class is first priority. You’re welcome to look at what’s on display, and I can stop and talk to you for a few minutes during various break-times. 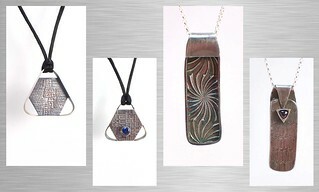 After that, the next chances to purchase some of my creations will be in our Metal Clay Guild’s booth at the Creative Marketplace in Verona on June 1, and then in the Koolkat both down at the Three Rivers Arts Festival, June 6 to 15. More on those shortly! I look forward to seeing and talking in-person with some of my “local” readers at one or more of these events! 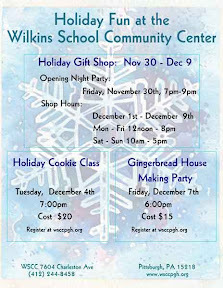 Once again, it’s time for the Holiday Gift Shop at the Wilkins School Community Center. Do come by this weekend if you get the chance: 7-9 pm on Friday evening (great opening night party, and it’s free!) or 10 am to 7 pm on Saturday and Sunday. I’m letting WSCC do the selling for me at this event because, with everything else that happens this time of year, I’ll be in and out all weekend. What I have on offer at this venue includes a number of class samples and workshop demonstration pieces. FYI, I recycle earnings from those into buying more materials to use in refreshing my memory on next year’s classes (the samples) and in making pieces as I illustrate the processes during classes (the demo pieces). They’ve expanded the event this year, from two rooms to three on the main floor of the center, so there should be lots of goodies on offer from a number of different vendors, for gifts or for yourself! And, while I’m writing, I’ll mention another event, next weekend, when I’ll have my studio open (upstairs at WSCC) from 10 am to 4 pm on December 14 & 15, and a little bit of everything will be on sale then (my full range of jewelry and other small adornments, information about workshops and home parties, gift certificates, …). 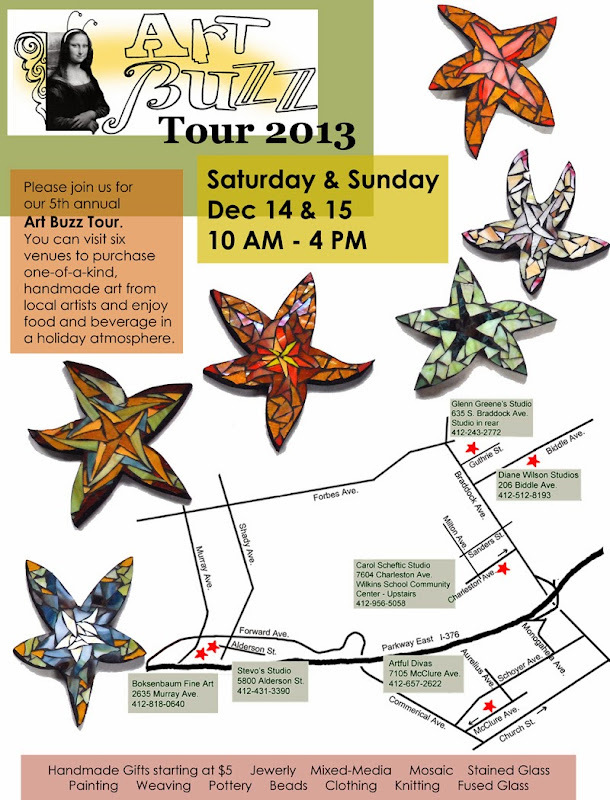 I’ll be one of the six stops on the annual Art Buzz Tour, so you can even just grab a map to all the other great sites. I hope that my “local” readers will be able to stop by, one weekend or the other. I really do appreciate all your support!!! Earlier this week, I carried 30 pieces (the jeweler’s limit…) downstairs at the Wilkins School Community Center (aka WSCC, where my studio is located) for their annual Holiday Gift Shop (HGS). A much shorter trip than getting over to Sweetwater (whose show, which I mentioned recently, is still going on) but, once again, the commission WSCC will get from my sales is going to benefit another worthwhile organization. I must say that I am so thankful that, this year, the Friday after Thanksgiving weekend and the First Friday in December are not the same day! For some reason, a number of groups / organizations with which I’m involved all try to “avoid the major holiday crunch” by scheduling major events for that one, super-crowded, day. So I am always torn between them! But, approximately one year out of seven (leap years do tend to confuse the pattern a bit), like this year, those two are not the same day. Whew! So I’m still waaaay to busy, but at least it seems somewhat more manageable. (In fact, I’m hoping to have both the time and the energy to get up and go orienteering on Saturday morning. In another lucky coincidence, that meet will involve less travel for me than any other I’ve ever attended: it’s actually within walking distance of my studio, not a two-hour drive away!) But I digress…. 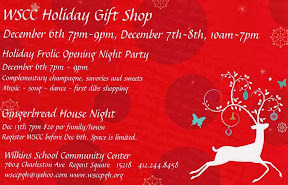 I mention that Friday-thing, in this context, because tonight from 7 to 9 pm is the Opening Night Party for WSCC’s HGS. In addition to several rooms full of a range of art and craft items, there will be food and drink and live entertainment, including the Steel City Ukeleles and Milton Street Carolers. By clicking on the announcement (upper, right) you can get information on the times it will be open each day from now through December 9. If you’ve never been there before, the building photo (lower, left), taken in the spring, may give you a clue where you’re looking to end up. I’ll be in the building, off and on, throughout the show. If you see my overhead lights on (in the window over the front door) and don’t see me at the HGS, do come upstairs and say hello. 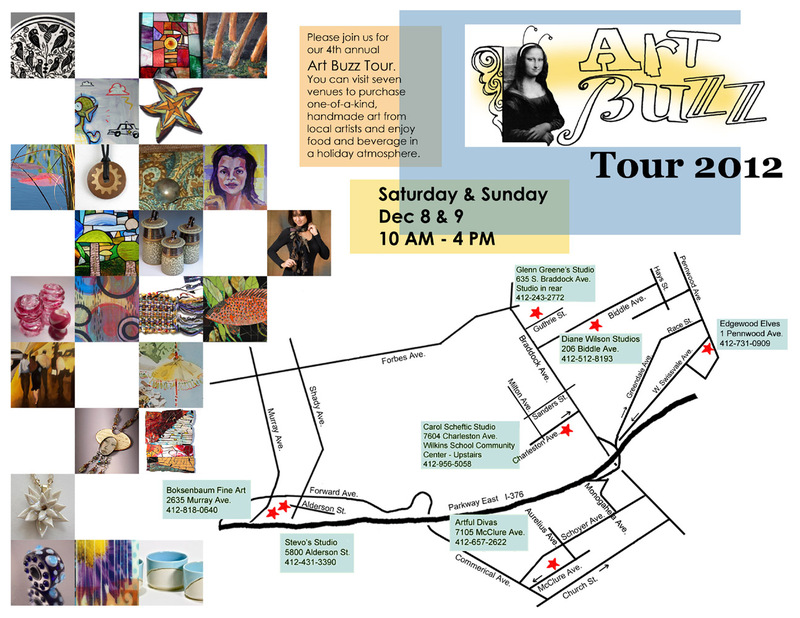 In addition to the pieces I’ll have in the HGS, I’ll also have my entire studio open myself next weekend, December 8 & 9, for a more extensive sale of my own precious metal and art jewelry items as part of the East End Art Buzz Tour. I’ll post a note about that in the next few days.